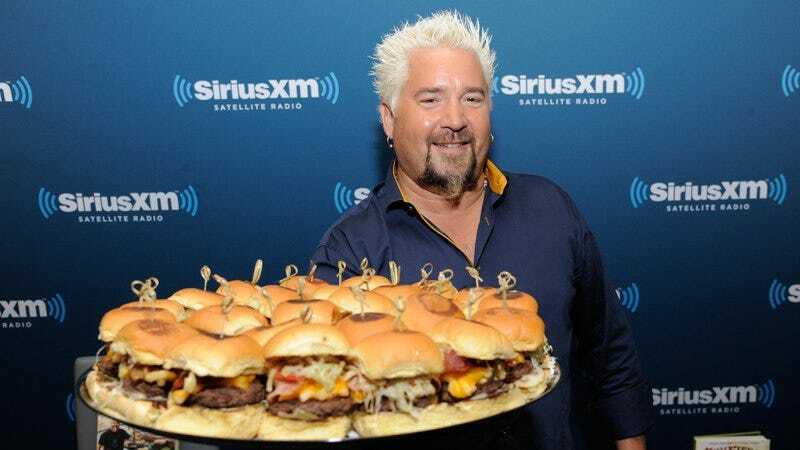 As fans of Diners, Drive-Ins, And Dives—or, as it’s known in its native language, “Triple D”—know, Guy Fieri speaks in his own private vernacular, a sauce-heavy patois that only briefly intersects with English at points like “dynamite” and “slamma-lamba-ding-dong.” One of the key pillars of the Fieri lexicon—and the TV host’s numerous restaurants—is Donkey Sauce, the mysterious concoction that he slathers on pretty much every high-powered calorie vehicle he sells. If we called it aioli, does that make it sexier? It’s aioli. This goes back to that exact comment that I said in the beginning: it’s about moderation. I called it Donkey Sauce because you have to make fun of it. It’s a quintessential ingredient in so many aspects of food, yet probably not the most beneficial except for flavor, probably the least beneficial, but it does have its place. So, hey, there’s one mystery solved. The rest of the Thrillist interview is worth reading, too, beginning with a simple but mind-blowing premise: What if you took Guy Fieri seriously? The end result is an in-depth conversation with a very successful, very ridiculous man with no apparent sense of irony, answering questions about his time in France by boldly declaring, “I studied life!” and comparing his decade-long televised gastrointestinal nightmare to Star Wars.